Motion (5.22.18) Councilor R. Mercier Request the City Manager have proper department install Security Cameras on 1st Street. As well as address issues of lighting, excess rash, beer bottles and drug paraphernalia. Motion (6.26.18) Councilor V. Nuon and Mayor B. Samaras : Request the City Manager provide an update regarding staffing at the Police Precincts in the City, particularly during nights and weekends. Motion (7.24.18) by Councilor E. Kennedy Request City Manager Assemble a three man Subcommittee consisting of construction professionals who currently sit on the Lowell High School Building Committee for the purpose of acting as a liaison between Lowell High School Building Committee and the Lowell High School Building consultants. Motion (4.10.18) Councilor K. Cirillo request City Manager instruct the Department Of Planning And Development to compile an updated inventory of vacant upper story downtown office/business spaces, including how long they have been vacant. Motion Councilor K. Cirillo City Council requests the City Manager provide the City with a report regarding the Safety of the Smart Water Meters installed throughout the City. Motions (5.15.18) Councilor E. Kennedy in support of Senate Bill 2506 and State Foundation Budget. Motion (7/24/18) Councilor J. Leahy request City Manager provide update to City Council regarding the Hamilton Canal Innovation District (HCID). Response prepared by Diane N. Tradd, Assistant City Manager and DPD Director with assistance from her staff members, Clare Ricker, Chief Design Planner and Joe Giniewicz, Urban Renewal Project Manager. The one page memo provides a good recap of what has been planned, implemented and projects waiting to be started. Response prepared by City Solicitor Christine O’Connor. “Crime Stoppers is a private corporation, neither owned or controlled by the City. Pursuant to a records review of the Secretary of State’s Office, the last Annual Report was filed on November 1, 2012. According to the report, the last meeting of this organization was June 27, 2012. M.G.L. c. 180, § 26A requires annual filings of such reports for all Massachusetts corporations, other than certain non-profits. Based on the absence of annual filings, it appears that Crime Stoppers of Lowell , Inc. is not currently in good standing as a Massachusetts corporation. Councilor J. Leahy: Request City Manager investigate the reasons for idling trains in The Lawrence Street area. Councilor J. Leahy: Request City Manager update Council regarding white building on Butler School grounds. Councilor J. Leahy: Request City Manager update Council regarding an appointment of a Neighborhood Service Coordinator for the City. Councilor J. Leahy/Councilor R Elliott: Request City Council endorse a rally to promote unity celebration in the community on August 28th at City Hall..
Councilor R. Elliott: Request City Manager explore feasibility of creating a 15 minute parking space at 178 University Avenue for local business. 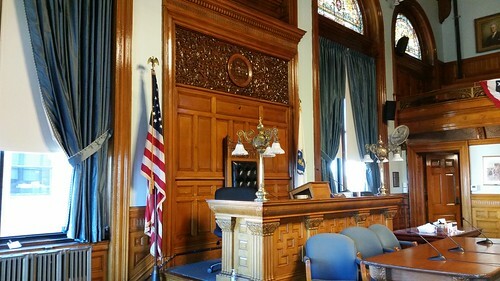 City Councilor R. Mercier: Request Council support displaying a bust of George D. Kouloheras in the foyer of City Hall next to bust of Clement McDonough at no expense to the City . City Councilor R. Mercier: Request City Manager have DPD provide a detailed presentation, justifying how filling in the Lord Overpass will be an improvement to the traffic congestion problems in the area. City Councilor D. Conway: Request City Manager include with each motion response the work hours that it took to accomplish the task and further include an estimate of costs for each motion. City Councilor V. Nuon: Request City Manager schedule a public meeting with new Police Superintendent as soon as possible after the hiring. City Councilor V. Nuon: Request City formally support h.r. 5754 (Cambodian Democracy act of 2018) passed by the US House Of Representatives and condemn the fraudulent elections that took place in Cambodia on 7/29/18; further request the City send a letter of support to Sens. Warren and Markey for passage of senate #2412 (Cambodian Accountability & Return On Investment Act—CARI) encouraging the restoration of civil and political rights of the opposition Cambodia National Rescue Party (CNRP), media and civil society organizations, restoration of elected officials to their elected offices and release of all political prisoners. City Councilor J. Milinazzo: Request City Manager meet with the Director of the Middlesex Shelter and neighborhood representatives to discuss illegal activities taking place outside and adjacent to the shelter. City Councilor J. Milinazzo: Request City Manager provide updated report regarding trash violations and fines collected to date. City Councilor K. Cirillo: Request City Manager have proper department install signage of updated parking rates replacing the old signage in the parking garages. City Councilor K. Cirillo: Request Environmental and Flood Issues Sub-Committee have the Lowell Sustainability Council present the Solarize Lowell program. City Councilor K. Cirillo: Request City Manager have proper department repair the perimeter fence at Eagle Park.